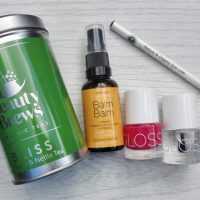 October’s LoveLula Beauty Box is worth £44 and contains an unusual facial oil, tamanu oil which I’ve been really intrigued by. It’s a highlight of the box for me as I haven’t tried it before and as a big facial oil fan, I always get excited about trying new oils. Although I am not a big makeup user I was happy to receive PHB’s vegan eye shadow of neutral colour and PHB Eye Shadow Brush – they will come handy for those nights out and special occasions. If you’ve been following me for a while you will know all about LoveLula beauty boxes but for those of you who haven’t heard of them before, they are an amazing value for money. They are great for those switching to more natural beauty products and those who want to discover new green beauty products and brands. The monthly subscription is only £13.95 and for that you get a box worth between £40 – £60. Many times one product is worth more than the box itself so well worth it. Also to add, in the box you will get a 20% off discount code for all the brands from the box. I have previously tried Greenfrog’s Soapberry Handwash, a low-foaming handwash which left my skin feeling nice and hydrated. Greenfrog’s Soapberry Bodywash is also low foaming and I feel I have to use quite a bit in order to get a good clean. But it’s really good. My skin is left incredibly soft and so pampered, definitely something to try if you want to impress the other half. The product is cruelty-free, vegan and contains no parabens or SLS and other harmful ingredients. 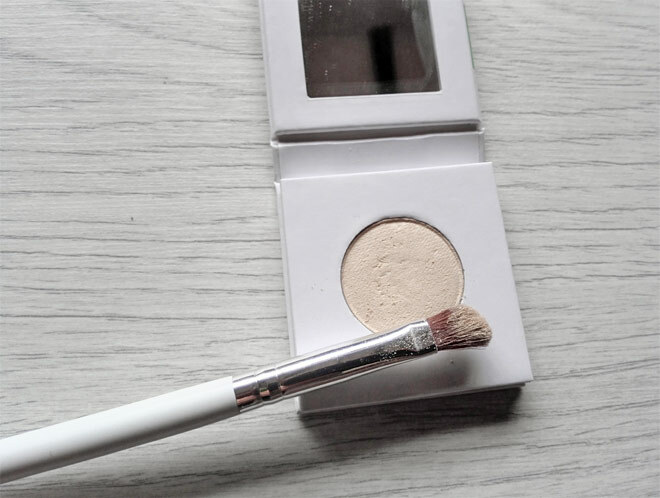 Pressed mineral eye shadow from PHB is of neutral colour, creamy/white-ish (Almond shade), and it’s great for highlighting under-brows (on LoveLula’s website the shade looks darker than it actually is). It has a slight sheen to it. It’s highly pigmented and also suitable for sensitive skin. It’s 100% natural and contains no talc or fillers, no mineral oils, no GM ingredients and no nano particles. I love that the pallet is eco-friendly and easy to recycle. The product is vegan and cruelty-free. PHB Eye Shadow Brush is also vegan & cruelty-free and made from ultra-soft brush hairs that are gentle to skin . You can use it for applying and blending colour to the lids and to highlight under-the-brow area. I’ve used it once and I can say it feels really soft on the skin. Tamanu oil is quite thick facial oil which smells really nutty/grassy. It’s green in colour and when looking at the bottle it seems like there is some kind of bits in it but they are not visible when applying. I would just say it’s not a clear oil and further research shows that it may separate at cold temperatures. Tamanu oil may not have the best smell but it’s extremely powerful oil, known as the ‘Oil of Gods’ – the natives of South Pacific believed that tamanu tree was a sacred gift from nature and that gods hid in its branches. Tamanu oil is known for its healing properties and it’s good for acne, scars, eczema, dermatitis, skin rashes, etc. You can also use it for hair and scalp rejuvenation and on your nails. The oil is a rich source of skin-friendly omega 6 and omega 9 fatty acids and also contains a number of active compounds that can rejuvenate your skin including canipyllic acid, friedelin, and canophylol. The oil absorbs pretty quickly, you just need to take care not to use too much. Learn more about this oil by reading this article. I think it’s an interesting oil to try and you can give it a go yourself by buying a travel size bottle on LoveLula website. I don’t normally use a cuticle oil but I’ve used this one a few times and it absorbs really quickly. To see how well it really works I would have to use it for a longer period of time. This is a light oil rich in vitamins A, D & E, all of which help to moisturise and promote healthy skin and nails. Check it out on LoveLula here >>. What do you think of October’s LoveLula beauty box? Have you tried any of these products? I haven’t plucked up courage to try the Tamanu Oil yet! The colour and smell really put me off – it does sound something worth trying though. I am already a fan of PHB Ethical Beauty makeup. I always use a neutral shadow, even if just using as a base for other shadows. I do look forward to that time of the month when my beauty box arrives! Tamanu oil was the first thing I’ve tried from the box although it didn’t look very pleasing but I was so intrigued! Definitely give it a go and see how you get on. I am used to the scent now but my other half hates it!